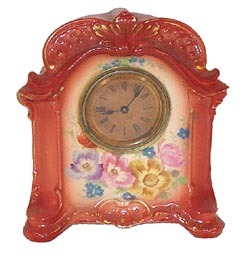 Ansonia Clock Co. miniature Royal Bonn clock named "Glory". It stands 6-1/2 inches high and has no breaks, chips, or repairs. The name Glory, Royal Bonn Germany, and various numbers and symbols, are fired into the case. Movement is one day, time only. The winding key is not long enough and is hard to get my fingers around it to wind. The movement has been in PaPas shop for repair because he forgot to put some of the screws back in place and left off a hand setting key. It tries very hard to run, and does run sporadically. Two inch signed paper dial, beveled glass, and plain brass dial surround. Ly-Ansonia, No. 2483.